HUNTSVILLE — Netflix star Marie Kondo now has a decluttering disciple in Huntsville. Marie Kondo congratulates her 220th certified consultant, Tim Lucier, who has opened his new decluttering business based in Huntsville. Geeked about the Japanese sensation? Meet Muskoka’s first certified consultant who is crazy about the KonMari Method™. TidyTim.ca is proud to announce that local decluttering coach Tim Lucier is now the 220th officially Certified Konmari Consultant in the world. 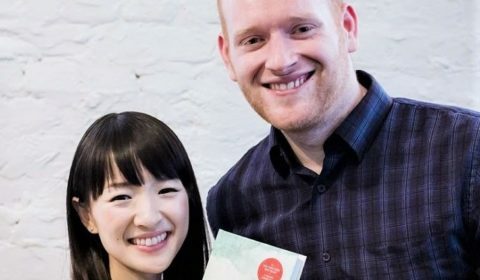 Fans of the recently launched Netflix series Tidying Up with Marie Kondo will recognize the name of the method, and the potential it has for changing lives. “I think a misconception people have after watching the show is that this is a solution for extreme cases,” Lucier says in a release announcing his new business. The KonMari Method™ grew to popularity after the book The Life-Changing Magic of Tidying Up first hit the New York Times Bestseller List in 2014. It’s a series of practical guidelines that encourages readers to declutter by category, rather than by location. The method is known for asking people to choose what to keep in their lives based on what “Sparks Joy;” a barometer that has helped hundreds of thousands of people to improve their intuitive decision-making skills in all areas of life. Lucier attended his first Konmari Seminar last February, and quickly made his way through the intensive training requirements. He will be making his services available throughout Muskoka, Almaguin, and North Bay. To celebrate his certification, he hopes to set up a series of local workshops on Kondo’s folding method. Let’s talk about applying the #KonMari Method™️ to your #business. So, how to organize these items that you need so much of? TidyTim Lucier is an official consultant of the Kondo Method. He will be offering decluttering seminars in the area and offering his services to home owners and businesses. 1. Throw out the old and damaged. Of course: if something does not spark joy, discard it! That old dust pan that has been in the business 20 years and everyone complains about? It’s time. A particular brand of cream cleanser is not loved by your staff? Encourage them to research a better version of the product. ??? 2. Think about how much you purchase at one time. Do you buy a box of 12, 24, 60? Find a space that will fit just that amount. Empty the box into the space and commit to buying that next box when your supply runs low. 3. Follow the KonMari method for storing things, tweaking it by putting duplicate items all in a front facing row if possible. This way you can choose which item to take off the shelf, and you’ll know which items are running low.